TAST 2012 25th week- cable chain stitch. This week’s stitch on TAST 2012 challenge by SharonB is cable chain stitch. 2. On the first row, cable chain stitch is worked over three straight stitches worked at even intervals. The second row,the cable chain sticth is combined with crossed buttonhole stitch. 3.cable chain stitch is worked with bugle bead rows. 4.the first row ,cable chain stitch is worked between two rows of herringbone stitch. The second row,I tried combining cable chain stitch with stem stitch, not very appealing though. The third row cable chain stitch worked over a row of vertical herringbone stitch. 5. first row is a combination of cable chain stitch with feather stitch. The second row, it is a combination of cable chain stitch with Cretan stitch, for some reason I like this variation. 6.this row is a combination of cable chain stitch with buttonhole wheel. This week’s cable chain stitch sampler is completed with this row. I worked a few more samples of cable chain stitch today. 2- In the first row , I laced the cable chain stitch. And combined cable chain stitch with untwisted chain stitch. 3-this row the cablechain stitch is alternated with twisted chain stitch. 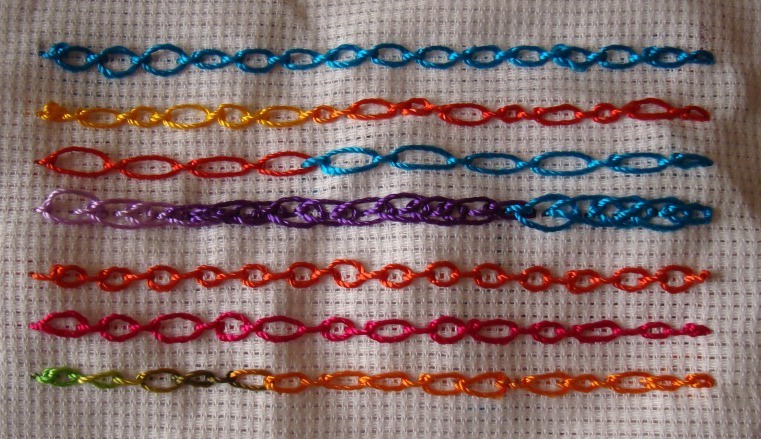 4-the zig zag version of cable chain stitch. 5-In the first row the cable chain stitch is whipped on both sides. In the next row, Cross stitches were worked in between the cable chain stitches. 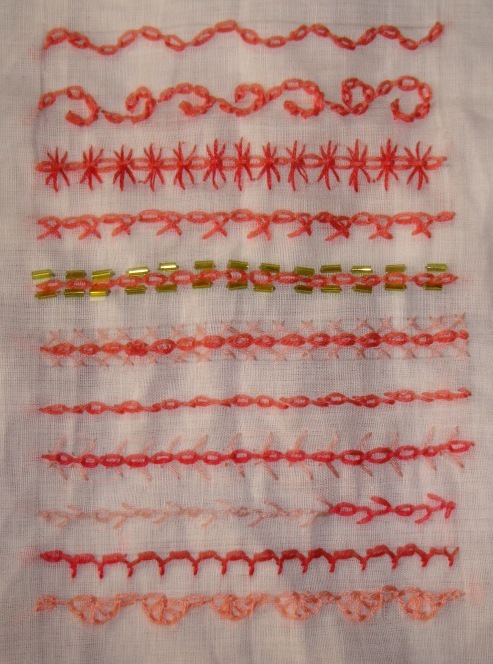 6- bunch of three detached chain stitches are worked on a row of cable chain stitches. 7-beads were added to a line of cable chain stitches. With these samples I am completing my sample stitches of cable chain stitch. Tomorrow it is knotted cable chain stitch. I am planning to do a stitch sampler with varieties of chain stitch for this week’s TAST 2012 stitch challenge by SharonB. These stitches are chosen from earlier TAST challenges . I had not explored them , when participating in those challenges. This way, I am able to work those unfinished stitches and also get to work on this week’s stitch. The first stitch chosen is cable chain stitch. This was the 36th week stitch of first TAST Challenge. Since I had not used this stitch much, I am starting to familiarize myself with this stitch.